There's no shortage of talent in this world and Kevin Stanton is proof of that. 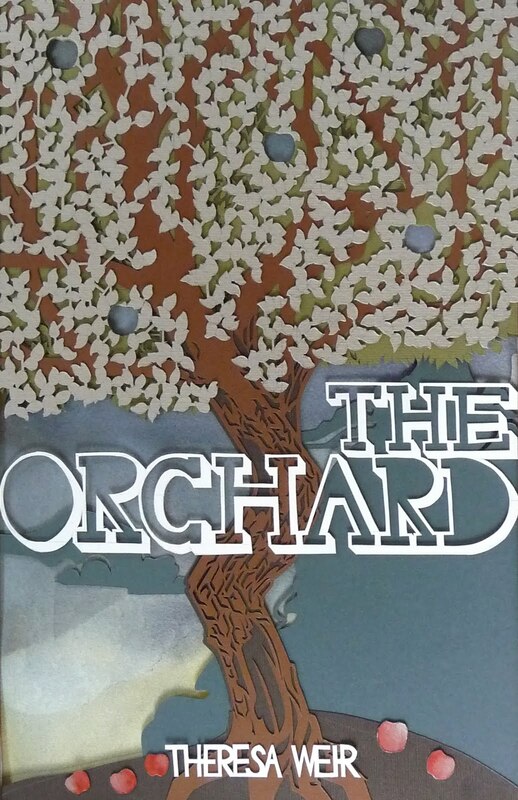 He's an illustrator and paper cutter I've had my eye on for a while now... I landed on his blog and spied his memorable business cards. Coolest cards ever - for sure you'd think twice before tossing away one of these hand cut beauties. 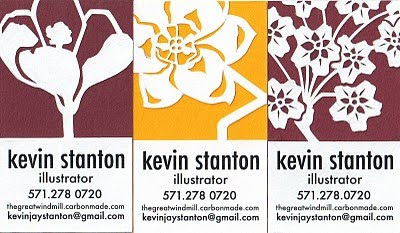 Kevin is a recent graduate of Pratt Institute for Illustration and resides in Brooklyn, New York. He has lots of interests, including music and plants, both of which are evident in quite a few of his designs. As a fan of singer Corinne Bailey Rae, I definitely relate to this piece. Check out the fine detail of her knitted sweater that plays so well against the angular cuts of her hair and features. 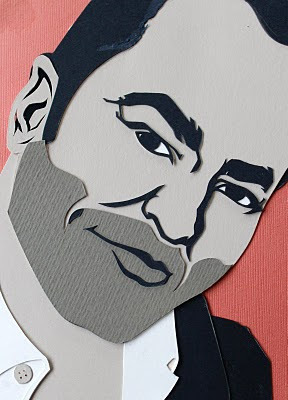 Actually, Kevin has done a whole series of cut paper portraits that you can find on his blog, The Great Windmill. Many are musicians, but fashion designer/film director Tom Ford caught my eye too... great resemblance! Kevin is always up for a challenge and enjoys working in different mediums. For this monarch / lion design, he combined watercolor paper with flat paper as an experimental sketchbook page. 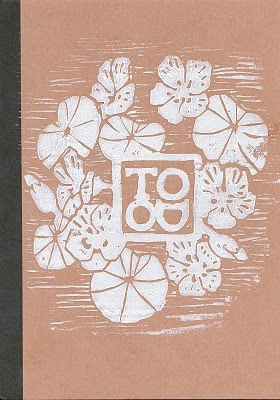 And here's a lovely and subtle woodblock print. To Do lists have never looked so classy. A proposal he designed recently for a book cover. Not your run of the mill seed packets! My very favorite of Kevin's work so far though, is this piece based on a painting by French artist, Fragonard, which is composed of paper strips. Clearly I've not tapped the full potential of my box of tangled quilling strips! Read an interesting interview with Kevin at Walking in Public. Such a talented artist!. 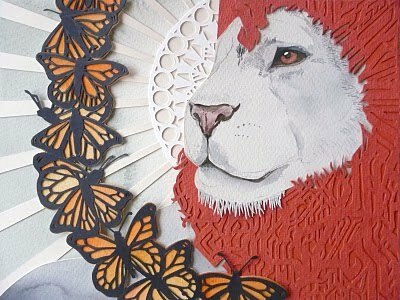 The monarch and lion piece is incredible so is the one made from paper strips. Thank you for sharing so many interesting works of creative and sooo talanted people from all over the world. I put a banner redirecting to this cosy plase in my blog - hope you don't mind. Wonderful work. I will definitely keep tabs on this artist. Thanks for bringing him to our attention. What a way to start my day. Very inspiring. Thanks a lot Ann, you do bring the best in the world of craft to your blog. Superb find. Very inspiring!! Those last two—the seed packets & strips portrait are my favorite! What a talented guy and to think he's just getting started. All the work is wonderful but the final piece you show here is a knock-out. Great talent! Здравствуйте, очень нравится ваш блог!!!!!!!!! Хочу быть постоянным читателем - не найду где зарегистрироваться, просмотрела весь блог!!!!!!!!! Спасибо, Лариса! Вы можете подписаться на обновления блога в правой боковой панели - на самом верху страницы. Просто введите ваш адрес электронной почты. Или следовать читатель, нажав на оранжевый и белый значок чуть ниже электронной почты зарегистрироваться пространстве. Thanks, Лариса! You can sign up for blog updates in the right sidebar - at the very top of the page. Just enter your email address. Or follow in a reader by clicking the orange and white icon just below the email sign up space. i love your work splendid!!! Ann Martin, спасибо!!!!!! !Я уже подписалась на обновление новостей, а как стать постоянным читателем??????? Wow, thank you everyone for the kind words. And thank you again and again, Ann, for posting my work like this. It's greatly appreciated and a big honor. 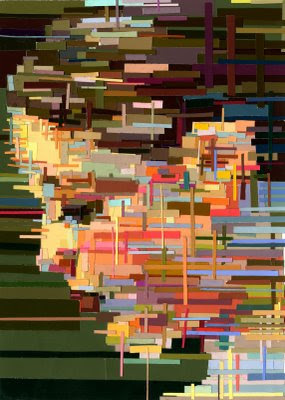 Yep, I think we can agree that Kevin's work is amazing... great post! Thanks for linking to his interview, too! 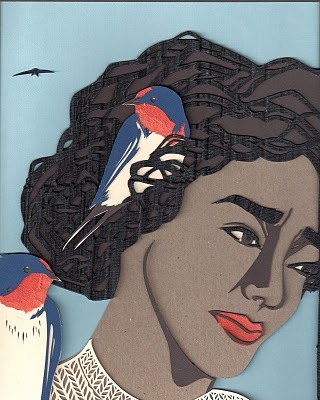 ..such lovely papercuts and my favourite is the Monarch butterflies, lion, collage; wow! you're so right about the abundance of talent out there, and kevin is no exception. thanks for sharing these beautiful pieces. Love those seed packets, so gorgeous! And the business cards are really cool. Thanks Ann for posting about yet another great inspirational artist. Also I really like the new look of your site! I was already floored by the business cards! Then, my mouth just kept opening wider as I scrolled down to the next and the next creation by Kevin! Thank you for featuring such inspiring talents, Ann. i adore those seed packets. seriously, just love them. and the business cards? amazing. i'd hoard them all to myself! Thanks so much everyone, and Kevin, it was my pleasure - keep up the great work! Wow. I love all of his stuff but the business cards and seed packets are particularly awesome!! Thank you again everyone! I'm really honored by all of your kindness. Amazing work - really incredible how much talent (and time!) there is involved! Thanks for introducing Kevin to us! Those are really great art works.I love them. Kevin, hope you have a good luck on your work.